With Star Wars: The Last Jedi now available on blu-ray as well as digital download, I wanted to share my thoughts on the bonus features that were included. Just by looking at what's included on the blu-ray and digital downloads it is clear that there is far more bonus material than there was with the last two films. And it's not a case of quantity over quality. What is included gives fans a far more intimate look at the making of the film than we had come to expect from the recent blu-ray releases. As soon as the film had come out, writer/director Rian Johnson was promising fans that they would be seeing some very cool deleted scenes on the blu-ray. As it turned out fourteen total scenes, of varying lengths with some being small little moments and others entire sequences, were included. In general the fun of deleted scenes is seeing what might have been and these are no exception. While there are some great moments that were shot for the film, ultimately with each scene you can understand why it was cut. Seeing Finn be confronted by one of his old stormtrooper buddies or having Rose bite General Hux's hand are cool, but the moments in the film ultimately play better without them. Probably my favourite moment in the deleted scenes is Rey telling Luke, "across the galaxy our real friends are really dying" at the end of the deleted caretakers sequence. I appreciate Johnson's explanation for cutting it, that having Rey and Luke leave things on a hopeful note after their second lesson so that it is Kylo who drives a wedge between them makes their split all the more heartbreaking. However, Ridley's delivery of that line is so powerful and Hamill's stunned silence speaks volumes. It really is a shame this moment was lost in the restructuring of their story. Also, Phasma's death is way cooler in the deleted scenes. I wish they could have found a way to save that. The main thing that needs to be said about this is that I'm glad Lucasfilm didn't screw around with fans on this one. Holding back JJ Abrams' commentary for The Force Awakens for the 3D blu-ray release that was months after the main home media release felt cheap, so I was pleased to see that there were no games this time around and the commentary was released with all the other special features. And the commentary is very good. Rian Johnson's personality lends itself so nicely to a director's commentary. He presents a nice mix of sharing Easter eggs and giving shout-outs to those on screen, while also offering insight into both the process of writing and shooting the film. One of the most talked about bonus features was the feature length documentary about the making of the film. The documentary crew were able to be on set throughout the entire shoot and were able to capture some fascinating footage of key scenes being shot. It really gives you a feel for what it is like to be on set making a Star Wars movie. From that standpoint The Director and the Jedi delivered in a major way, providing fans with the type of looks behind the scenes that we haven't seen since the making of The Phantom Menace documentary, The Beginning. What did strike me as odd, however, was the fact that the documentary leaned so hard on the "Mark Hamill has a problem with Luke's story" angle. Hamill publicly voicing his doubts about the direction Johnson took Luke is something that played out in the press following the film's release. Some fans, who were disappointed in the film, used the statements from Hamill as a means to attack Johnson for "ruining" Star Wars. Hamill has since apologized for making his doubts public and has been very complimentary towards The Last Jedi as whole (though his words continue to be used by those who feel the need to "prove" something about the film). Given the hullabaloo that was caused by Hamill's comments, it seems strange that the film would emphasize them the way that it did. Granted, the documentary's director, Anthony Wonke likely had the layout of the film largely in place before the The Last Jedi's release and the subsequent craziness over Hamill's comments. Which is to say it was probably always the plan to address Hamill's concerns in the documentary. However, in light of the circus that played out (and, in some circles, continues to play out), it is curious to see it in any sort of official release. That being said, there is something commendable about including it in the documentary. It shows that they committed to telling the full story in the documentary, regardless of what was happening in fandom and the press. Either that or it was too late to change the documentary by the time this all played out. Regardless, it's clear that The Director and the Jedi puts the emphasis much more on "the director" than "the Jedi". The documentary really gives us a taste of what Johnson's experience was like day-to-day, but we don't really get that same feeling from Hamill. Obviously there's much more footage of Johnson because he is on set every day whereas Hamill is usually only there when the Luke scenes are being filmed. There are some moving moments with Hamill (like when he sees Yoda again for the first time since shooting Return of the Jedi), but there just aren't enough for the film to live up to the film being billed as Johnson and Hamill's journey. (It seems like they could have just incorporated most of the Hamill moments into Johnson's journey and made Johnson the sole focus of the film. But then just calling it "The Director" doesn't have the same sense of grandeur as The Director and the Jedi). That being said, Wonke and his crew did an amazing job at capturing both the big and little moments on set. We get a great look at everything that went into Rey and Luke's final showdown on Ahch-To, when Rey chooses to go after Kylo Ren. We get to see both the big special effects shot of Luke destroying her hut when he walks in on her Force connection with Kylo being filmed, as well as the rehearsals of their conversation with Hamill and Ridley, months before the scene was shot. There's also some fun moments that are enhanced by the audience knowing more than the people on screen. For instance, there's a few exchanges where Johnson and his producer Ram Bergman joke about how they'll miss all the Lucasfilm luxuries (massive sets, huge crews, etc.) on their next project, which they believe will be a low budget film. Little did they know at the time that their next project will be an entire trilogy of Star Wars films, with all the benefits of working with Lucasfilm and its world class crews! As a document of what life is like on a Star Wars set, The Director and the Jedi is virtually unparalleled, especially in the post-George Lucas era of home media releases. Even fans who did not enjoy The Last Jedi might be interested to see what it is actually like to be on a Star Wars set and intimately involved in the decision making process. Featurettes: Scene Breakdowns, Balance of the Force, and Andy Serkis Live! 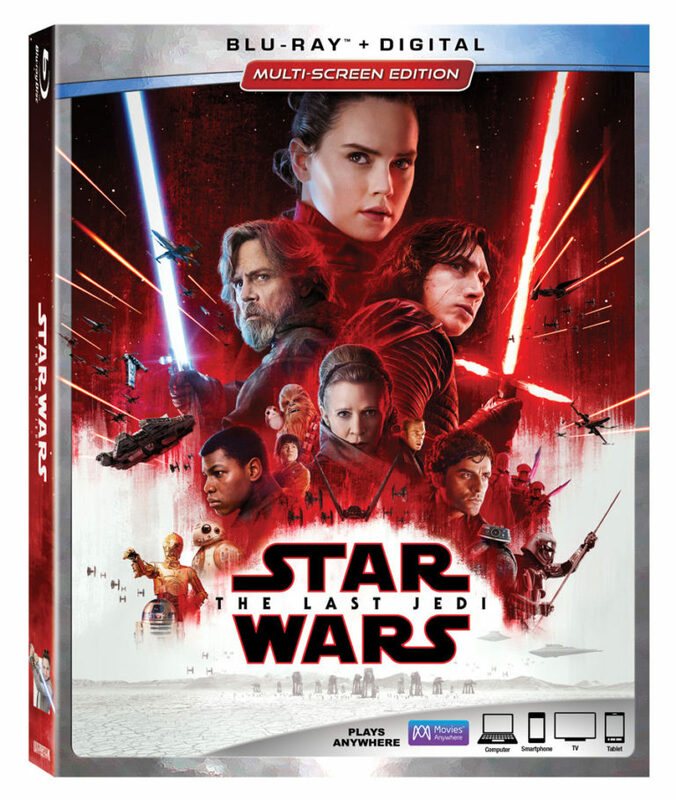 There are five main featurettes included on the blu-ray: three scene breakdowns, one featuring Rian Johnson discussing how he approached the Force in The Last Jedi, and one that is simply Andy Serkis performing Snoke on set before the CGI transformation. Seeing Serkis perform like that was fascinating. I feel that Andy Serkis is sometimes underappreciated as an actor, given his role in pioneering the motion-capture technology and that he so frequently plays parts that involve heavy CGI. So watching him perform those scenes, and seeing how he commanded the room with Snoke's presence, before the work to turn him into the scary bad guy was a real treat. This is the sort of thing I never would have thought to wish for as a blu-ray bonus feature, but I am so glad they included it. The Balance of the Force featurette I found to be somewhat underwhelming. There are some interesting insights, however it mostly felt Johnson was just stating things that were obvious in the film. While I have my issues with The Last Jedi, one place where I think Johnson really nailed it is how he handled the Force. So having him explain that it is not a super power, or why he ultimately decided that Luke Skywalker using the Force to take out one of the First Order's walkers was a bad idea didn't feel like things that really needed to be said. This isn't to say the featurette is "bad" or should be skipped, simply that--for me--it didn't shed as much light as some of the other bonus materials. The scene breakdowns are really cool and really take the audience through the full process of filmmaking. Where The Director and the Jedi shows what it's like to make a Star Wars movie, these featurettes show how a Star Wars movie is made. The entire process from script to concept art and storyboards to shooting footage with actors and special effects to the sound design to the visual effects is covered. We also get to hear from a lot of more the people involved in the making of the film, including actors, concept artists, sound designers, and visual effects artists. If your curious about how something truly gets from page to screen, these featurettes are for you. Even though this technically isn't included on the blu-ray (although most blu-ray copies come with a code for a digital download of the film so you should be able to get it that way), it's so cool that I can't not mention it. This is another one of those things that I would have never thought to hope would be included with a home media release, but now that I know about it I want all Star Wars films to be released this way. Watching the film with just John Williams' score was such a fun experience as you really get to appreciate all the work he did on the film. By removing the dialogue and sound effects you also realize just how much music is actually in the movie (it is so much more than what is included on the soundtrack album). I was anticipating having to sit through large swaths of the movie in total silence, but there are very few times when this is the case. This version allows you to really appreciate the music in moments when you wouldn't be focusing on it when all the other noise is going on. Overall, this is probably the best home media release that Lucasfilm has produced in the new era of Star Wars. A lot of that can likely be chalked up to Rian Johnson's willingness to give fans a peek behind the curtain at the making of the film, as well as his relatively smooth production experience (we likely aren't going to get anywhere near as deep a look behind the scenes on Solo). The deleted scenes are fun and meaningful, the commentary is insightful and charming, the documentary lets you experience the making of a Star Wars movie and the featurettes show you how it was all done. I hope The Last Jedi sets the trend for what we can expect from a Star Wars home media release. Growing up I loved hearing the stories behind the making of the Star Wars films in documentaries like Empire of Dreams or The Beginning, and some recent Star Wars home media releases lacked that magic. The Last Jedi bonus features are the first time in the new era where it feels like that magic has been captured again.